The USC Thornton School of Music is located on USC’s University Park campus. Located next to one of the city’s major cultural centers, Exposition Park, USC’s 226-acre University Park campus (UPC) is just minutes from downtown Los Angeles and is easily accessible by major freeways. For more instructions on how to find the campus, go to the Visit USC. To locate USC’s University Park campus on Google Maps or similar mapping software, you may use the intersection of Exposition Blvd. and S. Figueroa St, Los Angeles, CA 90089. Parking is available on the USC campus for $10.00. Recommended Parking is Parking Structure X, located at Gate 3 at Figueroa St. and 35th St.
Metro provides bus and rail transportation to USC Thornton School of Music concerts via the Expo Line and runs until 2:00 a.m. on Fridays and Saturdays. For your best route or more info, visit the Metro Trip Planner or call (323) Go Metro or (323-466-3876). We are happy to announce a discount for Metro riders at three USC-owned restaurants. Before or after a concert at the Thornton School, show your valid TAP card, Metro Employee ID, or LA County Employee ID to your server at Moreton Fig, Traditions Bar & Grill, or The Lab and save 10% on your bill. Click here for more information. 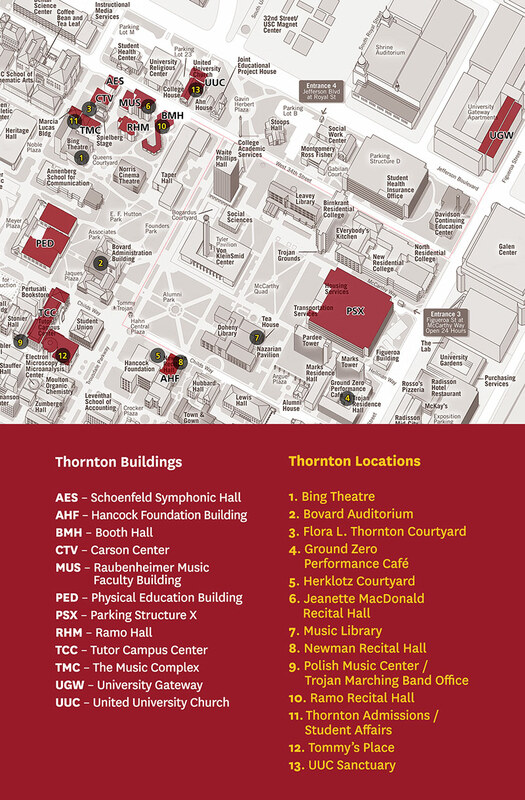 Click here to download a map of Thornton School buildings, offices, and performance venues. 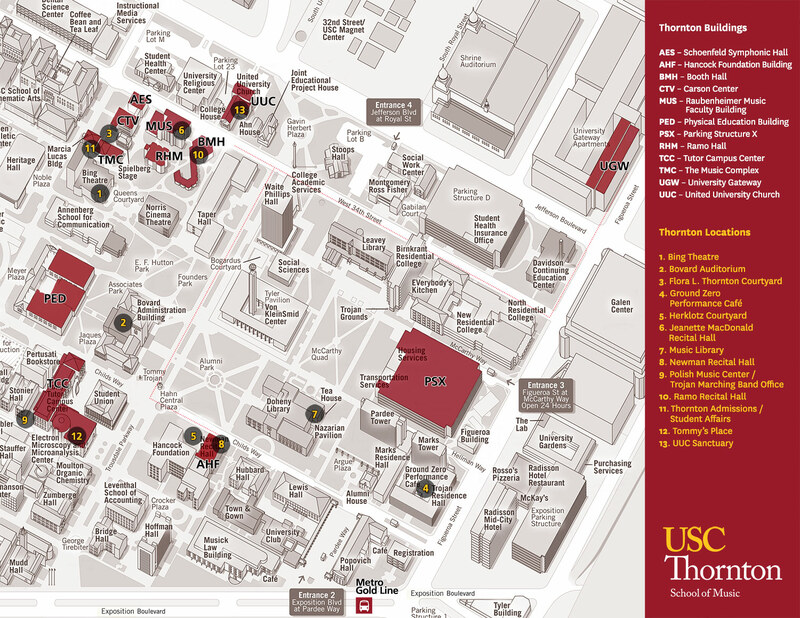 The Thornton School has offices, studio spaces, and performance halls in many different places across the USC campus. Refer to the map above for more detail. If you can’t find the service you’re seeking, a good place to start is the Music Operations Division. They’re located in the Booth Memorial Hall (BMH), Room 101, and are usually open 8:00 a.m. to 11:00 p.m. on workdays.